It might be one of the shortest flights in Australia but the 20minute QF2142 from Adelaide to Kingscote is one of the most thrilling. A short ascent and you’re cruising over the St Vincent Gulf before gliding in to land over lush green paddocks. Hopping off like you would a rollercoaster ride, your bags are waiting alongside a guide from Southern Ocean Lodge with a beaming smile. Whizzing along an empty highway, we stop for a gin tasting. It’s only 11:00am but KI Spirits is buzzing with travellers ready for a morning swig. This tiny distillery has won countless awards including taking out Australia’s best gin in 2016 and 2017. Using local botanicals, they produce a collection of premium gins that range from traditional to mulberry, whisky and a special blend for Southern Ocean Lodge. 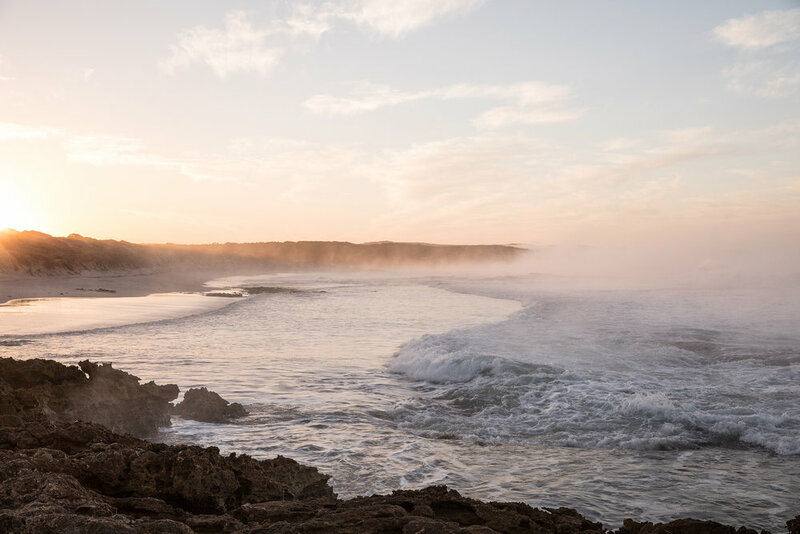 Checking in to the lodge you waltz in to The Great Room and are met with uninterrupted views of the Great Australian Bight. Sharp cliffs overhang a deep, dark ocean that roars with thunderous waves. Theres an open bar that exclusively stocks South Australian wines alongside a selection of snacks and teas and a library which may see you spending the afternoon reading about the works of Khai Liew. Once you slip in to a deep lounger, it’s a space where you easily lose track of time. 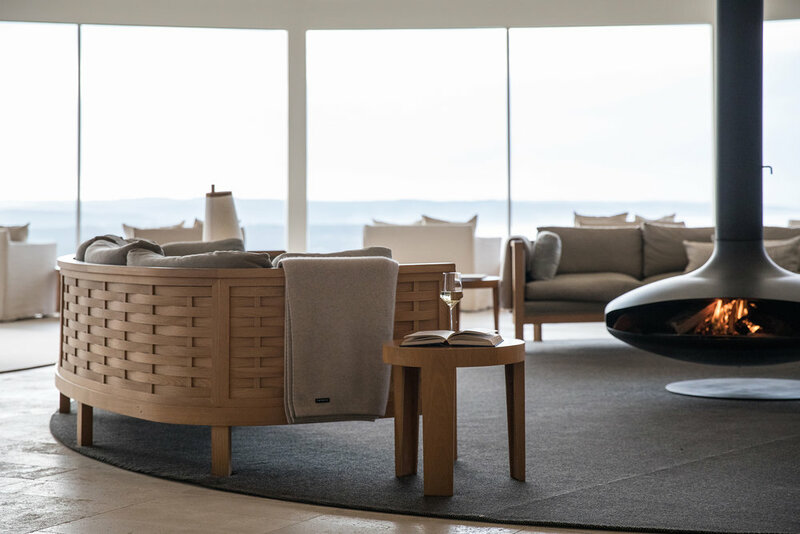 All rooms face south with a raised bed that leads to a sunken lounge, so views are unobstructed from every angle (even the rain shower overlooks the ocean). The Flinders Suite comes decked out in navy and natural hued linen with a kangaroo motif by Australian textile artist Julie Paterson. It’s the perfect spot for a Winter’s afternoon wrapped up in the room’s cashmere blanket, or if the sun is shining you can head outside to your patio and with a glass of wine from the suite’s included mini bar (which is topped up daily). 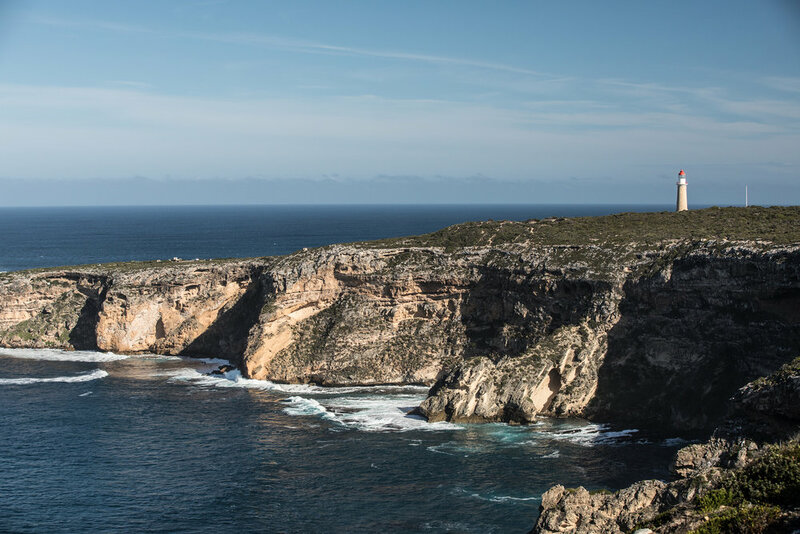 There’s an endless list of things to do on Kangaroo Island. Depending on the season you might be searching for hidden beaches and hiking trails or head out to spot Sea Lion pups. The island is often described as The Galapagos of Australia due of it’s abundance of nature and wildlife. We start our day with a sunrise expedition to Seal Bay with the resident Sea Lions. This private tour offers guests an exclusive encounter with the mammals and during our Winter visit the pups are out and about and very curious. Our small group is able to stroll along the stretch of the beach as the pups bound up around us ready to play. The tour concludes with a chef-cooked barbecue breakfast that consists of 65 degree poached eggs, sizzling bacon and sausages, zucchini fritters and banana bread. You can spend the afternoons participating in a coastal walk which starts at the lodge atop the limestone cliffs of Hanson Bay. It offers spectacular views of the rugged coast with nothing but the aqua blue ocean between you and Antartica. There’s plenty of flora and fauna to learn about along the way before heading back to the lodge for Kanga’s and Kanapes - a signature sunset experience. A quick drive down the road to Grassdale lies a historic property surrounded by open grass fields littered with kangaroos. 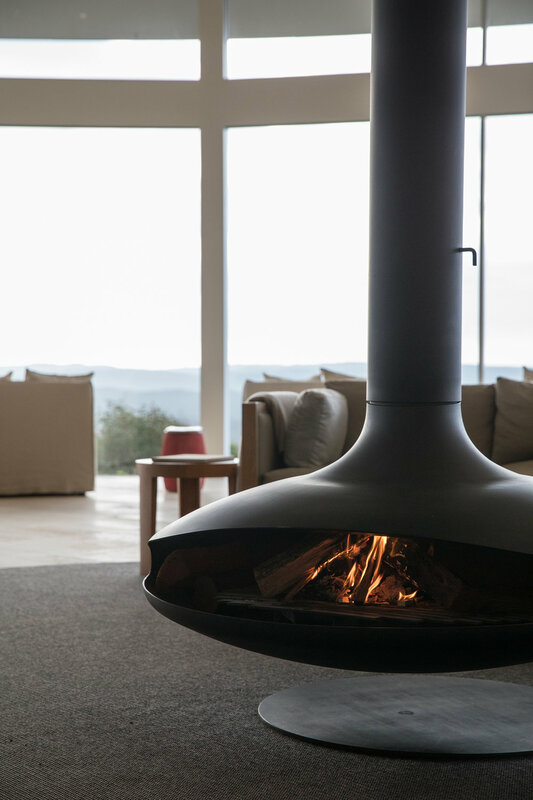 Guest are able to walk amongst the kangaroos whilst being served premium South Australian wine and nibble on canapés to a glowing sky as the sun drops. The following morning we head to a Koala sanctuary to spot the sleepy creatures high amongst the eucalyptus trees followed by a stop at Admirals Arch where we watch fur seals play in the waves. We break for morning tea at the Remarkable Rocks; granite boulders which took over 500 million years of pounding waves, rain and wind to form. After a second helping of an incredibly moorish blueberry friand, we hike back to the lodge. The long hike makes for a great excuse to book in to the lodge spa for a massage. The spa is an oasis in itself, perched on a clifftop overlooking the ocean. Treatments start with a foot bath using local botanicals to calm the mind before having your aches and pains eased by expert therapists using Australian-made Li’Tya products. Post-therapy, guests can relax in the chill lounge with a cup of tea and soak up views of the Southern Ocean. The day ends with a Baillie Lodge gin cocktail in front of the suspended fire pit in the Great Room. Lodge hosts serve canapés while guests mingle and watch the sun go down over the shrubby landscape. We peruse the wine cellar to pick our drop for the evening before being seated for dinner and tuck in to warm house-made bread and local olive oil. The menu offers modern Australian cuisine, with head chef Asher Blackford ensuring all produce comes from South Australia. Entree could be a plate of fresh kingfish sashimi followed by a main of crispy pork belly. Save room for dessert because the lemon soufflé was delicious. And if sweets aren’t your thing, there’s a great cheese selection to indulge in. Waddling back to our suite, there’s a koala shaped Belgian chocolate waiting on the bed. Needless to say, we’re very well fed. Dozing off with the patio door slightly ajar, the waves rolling in the distance are nature’s very own sleep soundtrack. And it’s here, with the woosh of the ocean lulling us goodnight you feel complete serenity. I was a guest of Southern Ocean Lodge and travelled courtesy of South Australia Tourism Commission.